Coming across the pretty, pedestrianised streets of St Christopher's Place is like discovering an oasis of Continental cafe culture in the most unlikely place - just off Oxford Street, not usually described as relaxing or chic. Given that St Christopher is the saint to call on when you've lost something the difficulty in finding this oasis is quite apt. Gees Court, the tiny street connecting it to Oxford Street, is so small it's easily missed - even when you know it's there. Luckily, Barrett Street provides a more obvious access and connects up around the back with Selfridges. The network of paved streets around St Christopher's Place is a real find, al fresco eating provides a welcome rest from pounding the West End pavements. Even shopping around here feels less frenetic than on the neighbouring Oxford Street and high street stores become boutique like. Strolling along Christopher's Place towards Regents Park, crossing Wigmore Street takes you to the pretty streets around Marylebone which is also worth a visit if you're in the area. 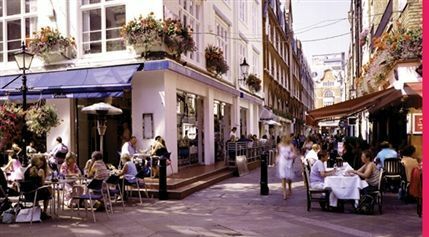 What are the best dining options near St Christopher's Place London? St Christopher's Place gyms, sporting activities, health & beauty and fitness. The best pubs near London St Christopher's Place. St Christopher's Place clubs, bars, cabaret nights, casinos and interesting nightlife. Where to have your meeting, conference, exhibition, private dining or training course near St Christopher's Place. From cheap budget accommodation to luxury 5 star hotels see our discounts for St Christopher's Place hotels, including Holiday Inn Oxford Circus from 82% off.